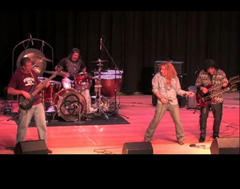 The Prezence is an authentic Led Zeppelin Tribute band that has been together for 10 years. This foursome of "brothers" formed a strong bond based on family values and the love of Led Zeppelin's music. Their show re-creates the live sights and sounds of one of the 1970s' greatest rock bands. The Prezence-- Chris O'Loughlin on vocals, Frank Perri on lead guitar, Ted Chmura on bass and keyboards, and Salvatore Michael DeMeo on drums--has played many venues over the years, including some fundraisers benefiting children with autism and Special Olympics; the band finds it very rewarding to help others in need.